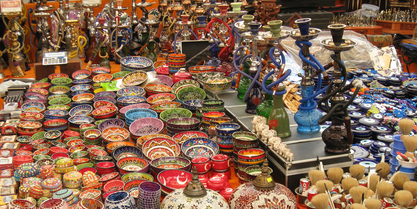 Don't miss going to one of the traditional Turkish markets. You will find almost everything there. It's a lot of fun to walk around. Do not buy for the first price - try to bargain, the people are very open for that. Local markets Akyaka market –Wednesday, Mugla market –Thursday, Gokova market – Saturday. Attractive hand made ceramics, although fragile, feature some exquisite patterns and scenes. Highlighted in vibrant colours of blues and greens, they are exhibited in a delightful display of tiles, vases, plates and bowls etc. Vases, ashtrays, cheese sets, egg cups and even the eggs themselves! Gifts, all carved out, of the pretty coloured and fine-grained stone. 'Tavla' (backgammon) - a national pastime, a traditional present! You will find an abundance of these boards, along with little boxes, walking sticks etc. Which are beautifully inlaid with different coloured woods, silver or mother of pearl. There's some wonderful examples of traditional handmade items crafted by Turkish women who spend many hours with hook and yarn in hand or skilfully weaving creations at the loom. From delicate lace mats, embroidered tablecloths, fine linens and cottons to colourful shawls, woolen scarves, socks and gloves. Cotton products are extensive, usually good quality and reasonably priced. For clothes it's overwhelming - a mass of T-shirts, sweatshirts, jeans etc. Bearing famous names, although fakes, are bargains! As yet there are no copyright laws in Turkey and cassettes can be recorded from a master, packaged and sold. There is an excellent selection, all original artists and far cheaper than at home. Compact Discs are also available but the selection is somewhat limited. You're bound to see the 'perfume man' - a character who meanders the markets, armed with a large shoulder bag from which he offers a range of perfumes. Well known brands, expertly packaged, but cheap. Smell a scent? - they're fake! Not just the traditional rose and lemon flavours, but a whole show of 'deliciousness'. If you like 'lokum', then you're in for a real delight! Pick a piece or two and create a whole section box of pistachio, sesame, walnut, milk, banana, cherry and orange etc. Vivid Colours, varied aromas - the spice stall is one not to be missed! Both herbs and spices are really cheap and you will find certain ones which are not easy to find at home, such as saffron. Thank you for the photos, Pip. What a makret! I've not seen sacks of spices like that outside of Turkey. Egg plants, ornamental gourds, chillies and, for me, the pot chrysanthemums. (My nursery was once Britain's leading producer.) We could quite easily have spent a small fortune here.All the best,Pip and Jacky.